Do Canadians know what their forbears did for freedom, and to bring about peace, during the two great wars and other conflicts of the twentieth century? Do they know that, in parts of Normandy liberated by Canadian sailors, soldiers and airmen in 1944, there are streets in communes and villages – from where many Canadian families originated – that bear the names of individual Canadians and their units? Do they know that men and women who survived the German occupation remember their Canadian liberators with affection, gratitude and respect, and that children growing up in Normandy today learn about them? The truth is that, in Canada, countless people have no idea of these events ever having taken place. At the opening of Le Mémorial in 1992, a remarkable modern museum on the outskirts of Caen, the Norman city liberated by Canadians in 1944, no Canadians were present. A pervasive American presence, including an elaborate memorial garden being erected by the American Battle of Normandy Foundation, made it seem possible that the collective memory of what Canadians had achieved would one day be forgotten. Representatives from Le Mémorial came to Canada, to urge Canadian participation in their work. It was at the least upsetting for the people of Caen and surrounding communes to see an apparent disregard by Canadians for the sufferings and triumphs they had shared during the liberation. Mr. Hamilton Southam, himself a veteran, followed this up by organising the Canadian Battlefields Foundation (CBF). This organisation first took on the task of assisting Le Mémorial in giving proper recognition to Canada’s role in the Second World War, then set about reminding Canadians of Canada’s role in both World Wars, thus perpetuating the memory and deeds of Canadians in those wars. A major part of this effort was to encourage and support Canadian university students in the study of war and peace. In 1994 the city of Caen celebrated the 50th anniversary of its liberation. Thousands of children participated in the commemoration and, in the warm July sun, they sat on the ground while the Mayor of Caen, Jean-Marie Giraud, recounted to them the story of their rescue from Nazi occupation, and the city’s rebirth after the war. Major-General Roland Reid, president of the Foundation, unveiled the CBF’s plaque, where the Canadians had entered the city on 9 July 1944. By this time the Department of National Defence and Veterans Affairs Canada had organised the “Canada Remembers” programme, and sent a Canadian Armed Forces guard and band to complement the ceremony. The following year, on 11 May 1995, to mark the 50th anniversary of victory over Germany, Prime Minister Jean Chrétien opened the Canadian Memorial Garden, for which the Foundation (helped by a generous contribution from the Canadian government) had raised over $1 million. The Memorial Garden marks Canada’s participation in the north-west European campaigns of the Second World War. Commonwealth War Graves Commission cemeteries, numerous unit-sponsored monuments, and a plaque located on Juno Beach by the Historic Sites and Monuments Board of Canada, and the Juno Beach Centre are now to be found in this part of Normandy. The CBF Memorial Garden remains a point of departure for visitors, a dignified place of quiet reflection, honouring the memory of the naval, army and air force personnel who took part in the Battle of Normandy, and identifying all the communes they bravely liberated. This was only a beginning. How can we ensure that Canadians learn of the achievements of their forebears in the cause of peace and freedom in two world wars, encourage the study of these matters in universities, and perpetuate the memory of deeds done by Canadians? How can we preserve the precious link with the countries that Canadians liberated? Working in close co-operation with the official historian at National Defence Headquarters, and the staff of Le Mémorial, the Foundation contributed to the mounting of an exhibition entitled “Le Canada au secours de l’Europe” (“Canada to the rescue of Europe”) an exhibition that proved so popular it was extended for a year. 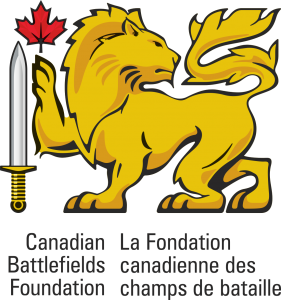 In 1994, the Foundation also co-published, with Wilfrid Laurier University’s Centre for Military, Strategic and Disarmament Studies, battlefield guides by Professor Terry Copp for Canadians visiting Normandy and north-west Europe. The same year the Foundation commissioned the eminent Canadian historian, J.L. Granatstein, to write a short history of the Normandy campaign for Veterans Affairs Canada, to be distributed to high schools. Finally, the CBF launched the Normandy Bursary programme. This student bursary programme is the pinnacle of the Foundation’s efforts. In 1995 the first twelve men and women from universities across the country won bursaries to travel to Normandy and the Low Countries for three weeks in the summer, under the direction of a well-established historian. By walking the ground, meeting the people of the region, and discussing in detail what they were seeing and hearing, they acquired an incomparable understanding of what Canadians had done in Normandy and north-west Europe during two world wars. Like the students who had designed the Memorial Garden, they had not fully absorbed the cost of freedom, until they were overwhelmed by the rows of headstones in Commonwealth War Graves Commission cemeteries, the terrible meaning of war. That struck home. Professor Terry Copp, of Wilfred Laurier University ably assisted by Dr Serge Durflinger, now teaching at the University of Ottawa, conducted the tour in 1995, 1996 and 1998. In 1997 and 1999 Professor Marc Milner of the University of New Brunswick led the group. In 2000 Lieutenant Colonel David Patterson and Serge Durflinger led the tour. In 2001 Marc Milner again led the tour, accompanied by Lieutenant Colonel Patterson. So it has gone through 2004 and the 60th anniversary of DDay to 2005 and the VE day tour. The students, who pay about one third of the costs, and have gone not only to Normandy but also, on various occasions, to Belgium, the Netherlands, Italy and the United Kingdom, to Dieppe and to First World War sites on the Western Front, have come home profoundly affected. The ability to impart their knowledge to others is a key factor in deciding who participates in these tours. This remains key to the Foundation’s cause, for all tour participants who have gone to Europe return to share their experiences with others, and keep the memory alive. Initially students stayed at the Abbaye d’Ardenne, just outside Caen. This ancient abbey was recently restored by the regional government as a student residence. For a brief period in 1944 it was the headquarters of the 12th SS Panzer Division under Standartenführer Kurt Meyer. Every year, on the 7th of June, the students attend a moving ceremony arranged by the Foundation in conjunction with Le Mémorial in the peaceful, shaded garden of the Abbaye. They join survivors of the German occupation, local dignitaries, and representatives from Veterans’Affairs Canada, as well as the Canadian Embassy in Paris, and occasionally some American students with whom the Canadians have shared the Abbaye. Mr. Jacques Vico, whose family has farmed fields adjacent to the Abbaye for generations, recounts the story of twenty young Canadian soldiers murdered by their SS guards in this garden on the 7th and 17th of June, 1944. Mr. Vico recounts his story with fierce passion moving many in the audience to tears. It was Mr. Vico who, with his mother, first found evidence of the atrocity. There were other victims – fifty-five men from the Royal Winnipeg Rifles were also shot in cold blood at the Chateau d’Audrieu, near Bayeux, and evidence was found of many more in Normandy – but the Abbaye, with its lovingly-tended garden, possesses a special ambience. The Vico family erected a small shrine, which now includes a plaque mounted by members of the Canadian military who visited the site some years ago. At no time is Canada more closely linked to Normandy than at this moment, in the presence of young Canadians, grieving for the terrible loss of life, for the ordeal by which our country established a timeless bond with this lovely land. The Foundation continues to strive toward endowing in perpetuity its Bursary Fund, a difficult task in today’s fund-raising climate. Please help. Blackburn, George. The Guns of Normandy (Toronto: McClelland & Stewart), 1995. Blackburn, George. The Guns of Victory (Toronto: McClelland & Stewart), 1996. Campbell, Ian J. Murder at the Abbaye (Ottawa: Golden Dog Press), 1998. Copp, Terry. A Canadian’s Guide to the Battle of Normandy (Waterloo, Ont. : Wilfrid Laurier University Press), 1994. Douglas, W.A.B. and Brereton Greenhous. Out of the Shadows, Canada in the Second World War (Hamilton: Dundurn Press), 1995. Granatstein, J.L. Normandy, 1944: Canada Remembers (Government of Canada: Veterans Affairs), 1994. McAndrew, William, Donald Graves and Michael Whitby. Normandy 1944: The Canadian Summer (Montreal: Art Global), 1994. Margolian, Howard. Conduct unbecoming: the story of the murder of Canadian prisoners of war in Normandy (Toronto: University of Toronto Press), 1998.